There is little doubt about who has been the best known person in Tanzania during the last few months. 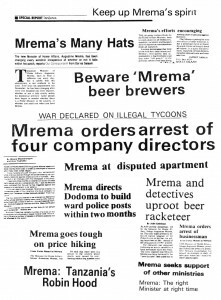 It is Mr Augustine Mrema, Minister for Home Affairs, variously described as ‘TANZANIA’S ROBIN HOOD’ and the ‘MINISTER WHO IS WILLING TO BARK AND BITE’. His name has been in the press almost every day as he has travelled from end to end of the country in a massive government anti-corruption drive. Home Affairs Minister Augustine Mrema has ordered the immediate arrest of four directors of a local company selling non-Tanzanian textiles labelled’ From Tanzania’. The clothes, which originated in Taiwan, were relabelled in Dubai and then exported to the USA as Tanzanian-made. (December 14,1990). Ndugu Mrema has ordered t he number of shops at the Namanga border post with Kenya to be reduced from 300 to 10. The number was far too great for a Namanga population of 3,000 he said. A businessman was quoted as saying that a number of the shopkeepers had been able to buy themselves BMW’s and Mercedes Benz cars hardly four years after opening shops on the border (January 15). Police action has been ordered by the Minister against people involved in the Shs 51 million theft at the Building and Hardare Supply Company (BHESCO) in Dar es Salaam (January 27). Immediate arrest and prosecution of people for allegedly defrauding the National Milling Corporation (NMC) of Shs 237 million has been ordered by the Home Affairs Minister. Fourteen of these are senior NMC officials while the rest are directors of private companies alleged to have colluded with them (February 11). “Police stations are not torture houses” stated Minister for Home Affairs, Augustine Mrema. “Police must not victimise innocent people. They must thoroughly investigate cases and advise higher authorities objectively. Even orders from me must not be executed blindly, because I am a human being and may have been told lies” (March 22). Plain clothed policemen, led by the Minister for Home Affairs, on Thursday night arrested a Detective Sergeant of the Police Force at a bar. Safari Beer was being sold to her at Shs 260 instead of at the official price of Shs 199. Hundreds of Kurasini resident s gathered at the bar to witness the law enforcement official facing the music and some started chanting ‘Safi Mrema’ … ‘Endelea kuwanyoa’ (Well done Mrema; keep it up). The Police officer was subsequently fined Shs 6,000 and the barman Shs 1,000. 19 other people were fined later for similar offences (March 23). The entire management of Rajani Industries left Dar es Salaam for Lindi yesterday to clear its accounts with the Lindi Regional Cooperative Union after the Minister for Home Affairs had ordered the arrest of businessmen who he was told were owing the cooperative money. Minister Mrema apologised on behalf of his Ministry for the wrongful arrest of Dodoma resident Salome Mazengo and for the loss of her fish worth Shs 70,000. He presented her with a cheque for Shs 20,000 as part compensation and said that any officer causing such a loss to a person would have to bear the costs. The victim said that she had persuaded fellow passengers in a lorry to refuse to bribe the traffic police en route. She was later arrested by the Police for obstruction to Police on duty. Addressing thousands of Singida residents. 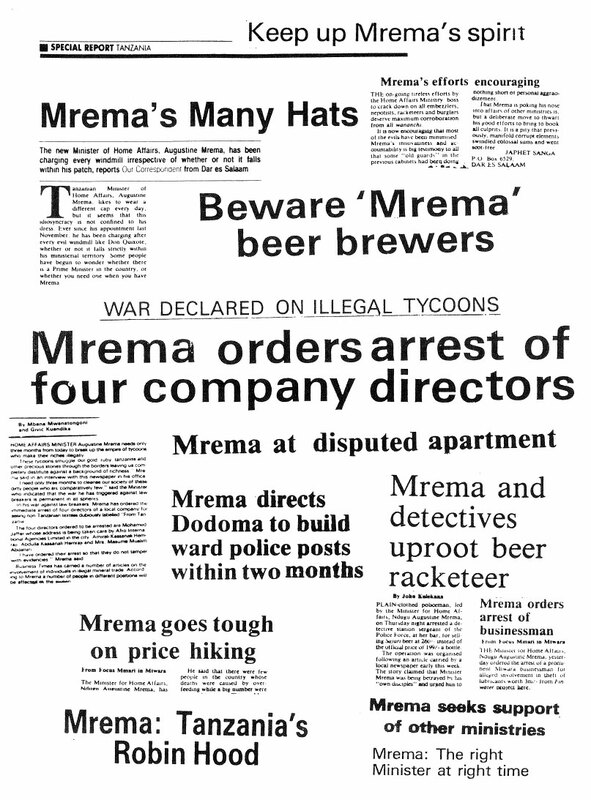 Minister Mrema revealed a major scandal, exposed with the help of Interpol Canada, and involving some US$ 3.9 million through unpaid telephone calls to Canada. The loss was expected to grow when pending bills for international calls to Britain and the Middle East were added, he said (March 28). Ndugu Augustine Mrema has given the Tanzania Cotton Marketing Board and one foreign company seven days to give a detailed explanation on the importation of restricted pesticides worth Shs 96 million. He named a Swiss company and explained that the order was for DDT which was against the code of conduct of the Agro-Chemicals Association of Tanzania (March 31). Minister Mrema has ordered the arrest of a prominent Mtwara businessman for alleged involvement in the theft of lubricants worth Shs 3.0 million from a Finnish-funded water project (April 1). Augustine Mrema said he was surprised to learn that the town was threatened by a group of gangsters popularly known as ‘Tule wapi’ (‘Where shall we eat’). “Tell them that from July they will be eating at Keko Prison” he said amid ululatlons (April 2). Sixty four businessmen and telephone operators have been arrested for collusion in making international telephone calls without paying Shs 2.7 million, the cost of the calls; they were caught following the introduction of a computerised device recording all data on international calls. The Minister for Home Affairs has demanded an urgent explanation of the alleged Shs 286 million tax evasion racket by the Tanzania Bottlers Ltd and Customs and Sales Tax Department officials. The officials were instructed to meet the Minister two days hence in Dodoma at 8.00 am (April 11). The Government will enhance security around Home Affairs Minister Augustine Mrema to ensure that criminals do not have access to him – President Mwinyi speaking in Zanzibar (January 4). He went on: “Some of my colleagues will not like me for what I am doing … Some have said I am driving too fast, that I will fall early. When President Mwinyi gave me this job he did not tell me what speed to drive” (December 28, 1990). “No! I’m not resigning”. Home Affairs Minister Augustine Mrema yesterday dispelled rumours that he intends to resign because President Mwinyi is frustrating him. “These are but outright malicious and nonsensical artful whims by a few individuals … the President is giving me full support” he said (March 8) – Daily News, Sunday News, Business Times. 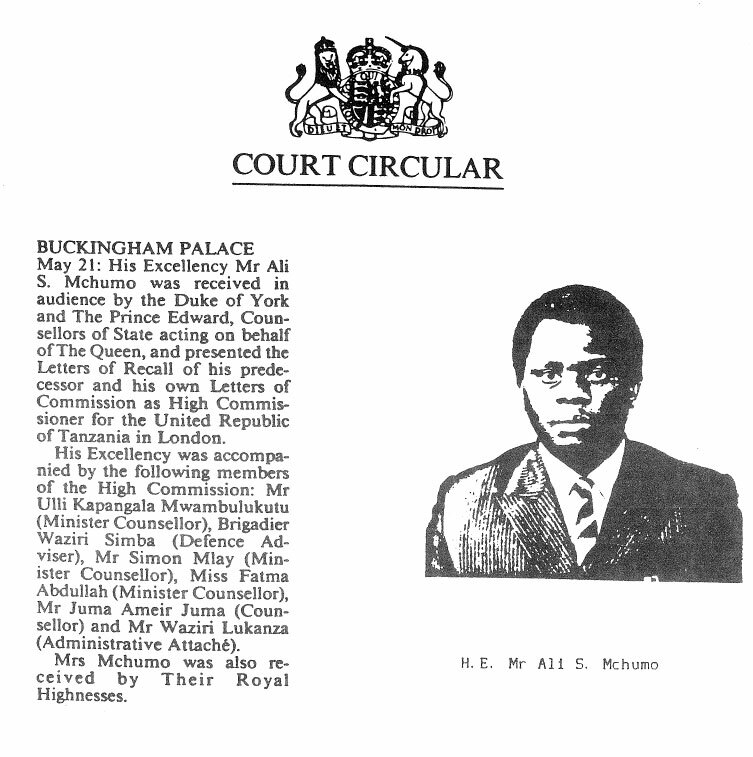 May 21: His Excellency Mr Ali S. Mchumo was received in audience by the Duke of York and The Prince Edward, Counsellors of State acting on behalf of The Queen, and presented the Letters of Recall of his predecessor and his own Letters of Commission as High Commissioner for the United Republic of Tanzania in London. His Excellency was accompanied by the following members of the High Commission: Mr lli Kapangala Mwambulukutu (Minister Counsellor), Brigadier Waziri Simba (Defence Adviser), Mr Simon Mlay (Minister Counsellor), Miss Fatma Abdullah (Minister Counsellor), Mr Juma Ameir Juma (Counsellor) and Mr Waziri Lukanza (Administrative Attache). Mrs Mchumo was also received by Their Royal Highnesses. The first of three State Landaus arrived at Buckingham Palace just before 12 o’clock pulled by four horses. If it had been an Ambassador inside there would have been only two. But this carriage was carrying His Excellency Mr Ali S. Mchumo, a new High Commissioner and Tanzania is a member of the Commonwealth not a mere foreign country. Accompanying the High Commissioner was the Marshall of the Diplomatic Corps Lt Gen. Sir John Richards KCB KCVO resplendent in a much decorated uniform. Two more carriages followed with staff from the High Commission. And then came a car carrying the High Commissioner’s wife. Had there been a King rather than a Queen ruling Britain things would have been slightly different. Mrs Mchumo would have not been there at all. She would have had a separate meeting with the Sovereign in the afternoon of the same day. Queen Elizabeth created a new tradition when she decided to combine the two ceremonies into one. The ceremony took place in what is described as the 1844 room in the P a lace. 1844 because that was the year when the room was refurbished prior to its occupation by the Emperor Nicholas of Russia on a State visit to Britain. There are two paintings in the room – one of George, Prince of Wales and the other of Frederick, the second son of King George III. Mr Mchumo was transferred to London recently from the post of Ambassador to Japan after the sudden and unexpected elevation of the previous High Commissioner, Mr John Malecela, to the post of Prime Minister (Bulletin No 38). Mr Mchumo has also served (from 1983 to 1988) as Ambassador to the Republic of Mozambique, with concurrent accreditation to Swaziland and Lesotho. Previously he had held various positions in the Government in Dar es Salaam including Junior Minister in the Prime Minister’s Office (1975- 1977), Deputy Minister of Home Affairs (1977-1981) and Minister for Trade (1981-1983). Earlier in his career he was Political Education Officer and later Chief of Personnel in the National Service and later a Major, then a Lt. Colonel and then a Colonel in the Tanzania People’s Defence Forces . Mr Mchumo has an LLB which he obtained at the University of Dar es Salaam in 1970. He went to school in Rufiji, Kilwa and Tabora. The Union Parliament met twice during the first part of 1991. During its first session in Dodoma beginning on January 29th it discussed eight papers on One-Party Democracy and the role of the National Assembly in legislation and in development planning. Two important new Bills were debated in a second session in April 1991. A Bill to allow for private banks in Tanzania was passed with amendments after it came under strong fire from certain members who felt that it went against the Constitution. They claimed that it did so because the Constitution prohibited the amassing of wealth in a few hands and also because it laid down that all the major means of production should be owned by the government. The Bill (which will be explained in more detail in our next issue) is the result of the work of the Presidential Commission of Enquiry into the Monetary and Banking System in Tanzania whose final report came out in July 1990 but was never published. A new Cooperative Societies Act which proposes a four-tier structure was applauded by several Members of the Assembly but the Government was warned that the law alone could not help to solve all the problems facing the movement nor facilitate the attainment of the Acts objectives. Minister of Agriculture Anna Abdullah said that, among other things, the Act would take power away from the Registrar and invest decisions on Society members, a move meant to encourage democracy. The Leadership Code and Party Membership Rules associated with Julius Nyerere’s famous ‘Arusha Declaration’ which laid out Tanzania’s political philosophy for the last 24 years were revised significantly at a meeting in February 1991 in Zanzibar of the National Executive Committee of the Chama Cha Mapinduzi (CCM) Party. Under whet hes come to be known as the ‘Zanzibar Declaration’ Party members are now authorised to participate in private economic activities. They can earn more than one salary, buy shares and take up directorships in private companies and build houses to let – things which were expressly forbidden under the Arusha Declaration. Explaining the changes CCM Secretary General Horace Kolimba said they would encourage more individual participation in economic activities and thus reduce the pressure on government institutions and parastatal organisations. He said professionals were expected to seize the opportunity to apply themselves fully in income-generating side jobs, the impact of which would be to create more employment opportunities. He admitted that many leaders and members of the CCM Party had been involved in corrupt activities and dubious accumulation of wealth contrary to the ‘Ujamaa’ policy. Many members had also started poultry schemes and housing projects in order to improve their economic conditions. He said that the trend now was for the Party to create conditions in which CCM members and Tanzanians in general could lead prosperous lives. This, he said, was the essence of the decisions taken in Zanzibar on the Leadership Code and party membership and they were not contrary to the Arusha Declaration. Mr Kolimba went on to say that when regimes are behind the times then it was necessary to ‘legitimise common sense’. Many Party members have expressed their dissatisfaction about the changes and National Executive Committee members have been visiting the regions to explain the changes. The rise in oil prices in the second half of 1990 has caused widespread disturbance to the economies of developing countries throughout the world. In the case of Tanzania the dominant influence has been the surge in oil prices in the last five months of 1990. This has been enough to cause serious loss estimated to be of the order of £40 million, or 2.8% of the Gross National Product. In terms of the fragile Tanzanian economy, an additional cost of this magnitude represents a severe burden on the economy and a critical setback at a time when there were real signs of progress. The consequence has been an addition to the already very serious negative balance on Tanzania’s foreign trade account and a grave setback for Tanzania’s industries struggling to make ends meet. It is a cause of satisfaction that oil prices have now fallen to approximately the level at which they stood prior to the invasion of Kuwait. Direct trade losses are believed to be minimal; trade with the Middle East does not feature as a separate item in the trade tables published in Hali Ya Uchumi. But importers generally have had to face increased sea freight costs and steeply rising insurance premiums, though these additional burdens are difficult to quantify. What is perhaps more significant is the possible 1055 of investment capital caused by suspension of the aid activities of the oil rich countries. It appears that in March 1990 Kuwait agreed to finance the rehabilitation and improvement of the Mwanza Textile Mill (MWATEX). On account of its preoccupation with domestic rehabilitation, it seems Kuwait will not honour such obligations in the near future. Some relief has been forthcoming from the donor community and in January it was reported that the United Kingdom Government had made a grant of £4.0 million to finance all oil imports over the next three months; virtually all of this money is reported to have been paid out. While this is a welcome contribution, it will offset only a small part of the losses incurred in the latter part of 1990. Any setback to the transport sector must be serious to Tanzania, already burdened by bad roads, rail transport in need of repair and development and an over stretched air communications system. The Gulf Crisis has emphasised once again the extraordinary dependence of Tanzania on access to fossil fuels and the sensitivity of the economy as a whole to the terms of access. Five weeks earlier, in Kampala, President Mwinyi reiterated his call to Iraq to immediately withdraw its forces from Kuwait to avoid further bloodshed. He expressed his sadness at the failure of the international community to avert the war – Daily News, Business Times. Although there has been a copyright law in Tanzania for literary and artistic works since 1966, its existence as well as its significance is unknown to most authors and artists. This was stated at a recent National Symposium on ‘Copyright’ organised by the Publishers Association of Tanzania in Dar es Salaam. Participants heard that there was rampant piracy of other people’s works especially in the video recording business. The participants also learnt that there were pirate publishers and printers who, through a ‘tender system’ used books of other publishers. The books were then sold at reduced prices. A report covering the years 1979 to 1989 from the Tanzania Audit Corporation stated that the trend of performance of parastatal accounting was very good. Between 1985 and 1989 the number of clean accounts improved from 41.4% to 73.7% – a clear sign of improvement and a trend which should be maintained. Of 461 accounts audited during the year ending on 30th June 1990, 245 companies were given a clean certificate. This represented a percentage of 53.2%. – the highest percentage ever attained in anyone year. The report went on to say that parastatal organisations made a loss of 5hs 4,198.9 million from 1979 to 1989. Many were becoming eaters and not creators of the national cake. During the decade 239 of the audited 461 accounts showed losses totalling 5hs 39,110.2 million as against 191 accounts which showed a total profit of 5hs 34,911.2 million. Large losses were by Industries and Trade, Communications and Works, Agriculture and Livestock, Water, Energy and Minerals, Local Government, Community Development, Cooperative and Marketing institutions Business Times. The French equivalent of the Britain-Tanzania Society, ‘Les Amities Franco-Tanzaniennes’ has recently reported, in its journal ‘URAFIKI TANZANIA’, on its last Annual General Meeting. The Society has some 70 members and the last time we had direct contact (Bulletin No 29) it appeared to be thriving. Lately, however, it seems to have been passing through difficult times. The President and Secretary had apparently agreed to occupy these positions only for one year and they, together with the Treasurer, now wished to resign. Continuation of the society’s activities therefore depended on a new team taking over. The debate illustrated how attached the members were to a continuation of the society even if in reduced form. On the other hand, the latest edition of ‘Urafiki Tanzania’ (January-March 1991) is one of the most informative that we have seen. It features a lengthy interview with the Tanzanian Ambassador in Paris, an analysis of Julius Nyerere’s career (‘La Voix de L’ Afrique’ …. ‘Maigr e Heritage Mais Pas De Regrets’), an article under the heading ‘The Struggle For Democracy’ and a rather sad piece on the equivalent in Dar es Salaam of what has become known as the ‘Cardboard City’ in London – DRB. Fourteen British businessmen visited Tanzania in March 1991 on a trade mission to search for local markets for British goods. They included representatives of coffee processing machine manufacturers, pallet racking and shelving systems, diesel engine suppliers and others. One member of the group, Mr Conor Robinson, an export executive of a London-based steel company, said that Tanzania had tremendous investment potential but the negative response by public organisations was hampering the investment business. He refused to name the parastatals and government institutions concerned – Business Times. The Tenzania/UK Business Group which was formed in London three years ago has recently produced its Inaugural Newsletter. 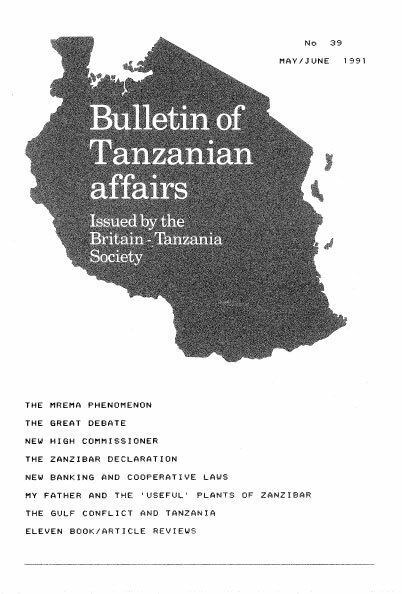 This 20-pege issue, in the same format as this Bulletin, contained articles on the Tanzanian Trade Centre in London, a report on a visit by a group of members to Tanzenia last year, the new Investment Code (Bulletin No 37) and the results of the elections to the Group’s Executive Committee. The principal officers of the Group ere Dr Fidehussein Remtulleh (Chairman), Mr Aziz Nasser (Vice Chairmen), Mr Simon Mlay (Secretary) and Mr Kassim Manji (Treasurer). Mr Manji defined the primary aim of the group as being ‘to get Tanzanian business people together and also those outsiders who are interested in Tanzania’s affairs, in order to ultimately play a part in the social and economic uplift of Tanzania’. It has been announced in Der es Salaam that Professor G. R. V. Mmari has been appointed to head up the proposed new Open University, under the Ministry of Science, Technology end Higher Education in Tanzania. His place as Vice-Chancellor of the University of Dar es Salaam hes been taken by Prof Mathew Luhanga who is an engineer by profession and was previously the University’s Chief Academic Officer. But members of the University of Dar es Salaam’s Academic Staff Assembly (UDASA) described the removal of the popular Prof Mmari as an ‘act of injustice’ and requested President Mwinyi to re-instate him. The unprecedented request was contained in a two-page statement issued after an extraordinary meeting on April 8th 1991 – Daily News. Outbreaks of rinderpest used to occur annually in cattle and wildlife in Northern Tanzania and Southern Kenya up until 1962 with the last recorded clinical outbreak in the area being in 1967. However in 1982 the disease was once again diagnosed on clinical and pathological grounds in buffalo and cattle at several widely separated localities in the north of the country. An intensive vaccination programme was started and the clinical disease disappeared once more, but the question remained was it possible for the wildlife and/or ‘shoat’ population to act as a reservoir of infection. After a couple of years research we found evidence that buffalo in the North and West of the Serengeti National Park had been continually exposed to the disease since 1982, whilst seropositive sheep and goats were found widely distributed in the north of Tanzania, especially in Simanjiro in Kitete District and Babati, Musoma and Tarime districts. Cattle have been vaccinated in northern Tanzania annually for many years but the intensity of vaccination has been increased considerably since the 1982 outbreak. Between 1985 and 1988 a country-wide cattle vaccination programme was carried out and the immune status of the notional herd monitored. It is known therefore that the possibilities of transmission of infection between wildlife, small ruminants and cattle have been greatly reduced. Consequently the virus must be cycling separately within each population of domestic smell ruminants and buffalo. It must be assumed that this will continue unless there is intervention with vaccination of small ruminants. This, however, will not result in eradication of the virus if it continues to cycle in wildlife. In summary, at present there is little, if any, reported clinical rinderpest in Tanzania, but the likelihood of the subclinical condition once more rearing its ugly head, particularly if the level of vaccination fa1ls, should not be underestimated. Mr MARK JAGO is a Veterinary Surgeon who spent two years from 1987 to 1989 on a project jointly organised by the Serengeti Wildlife Research Institute and the European Community looking at the epidemiology of rinderpest in the wildlife and sheep and goat populations of Tanzania.